Ziehm Vision² delivers high-quality imaging with low dose exposure on a footprint of just 0.8 m². It features a compact C-arm and monitor cart with an intuitive touchscreen user interface as well as two 19” flatscreen monitors. It has a high-resolution CCD camera that detects over 4,000 shades of gray. The monoblock generator’s unique liquid cooling system (Advanced Active Cooling) is specially designed for extended use in operating theaters, making the Ziehm Vision² ideal for a wide range of clinical applications such as general surgery, orthopedics, and traumatology. 18” TFT monitors provide bright, high contrast image with a wide viewing angle. Intuitive workflow with synchronized TFT touchscreens on c-arm and monitor cart. High resolution thanks to a dynamic CCD camera with 1 k × 1 k technology. Easy integration into existing networks (with WLAN option). Active Cooling for continuous performance during lengthy, demanding procedures. Counter-balanced c-arm for simplified positioning. The world’s fist C-Arm with flat-panel. Measuring 89.5cm, the larger C-arm opening allows easier patient access and improved positioning. 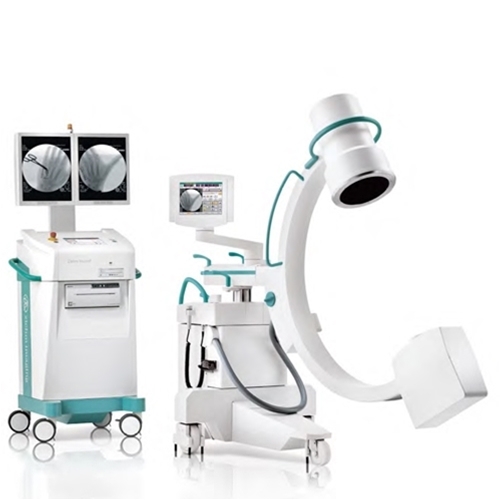 The world´s first C-arm with flat-panel technology enables fully digital, distortion-free imaging. In addition, insensitivity to magnetic fields gives the operator added flexibility. Ziehm Adaptive Image Processing (ZAIP) enhances image quality by adjusting settings fully automatically to anatomical conditions and regulating filters in real-time. The larger surface and square shape of the panel increases the image size compared with conventional image intensifiers. The Ziehm Vision comes with a highly compact monoblock generator. It generates short, sharp pulses with up to 25 frames per second, producing crystal-clear images even if the patient is moving. This intelligent pulse technology also reduces dose (as illustrated below). The high-dynamic CCD camera is a key component in the imaging chain. With 1k x 1k resolution and more than 4,000 shades of gray, it visualizes even the smallest anatomical structures. The optional flat-panel technology raises this to more than 65,000 shades of gray for even more detailed images. Among monitors, Ziehm Imaging’s dual 19” TFT color flatscreens stand out for their exceptional brightness and contrast. Even at a distance, the high-end monitors provide the physician with optimal insights by visualizing the finest details – from every angle. Ziehm Imaging has incorporated SmartDose in the current generation of mobile C-arms. This comprehensive concept for dose reduction allows the physician and staff to significantly reduce dose while optimizing image quality. SmartDose benefits both patients and staff alike. With significant savings Ziehm Imaging sets the benchmark in user-friendly adjustment of dose exposure. To achieve best results in intraoperative imaging, all C-arms with flat-panel detector are equipped with ZAIP (Ziehm Adaptive Image Processing) using hardware-based filters and the latest algorithms for noise filtering, edge enhancement and dose optimization. With a footprint of 0.8 m², the Ziehm Vision is one of the smallest C-arms on the market. Its compact design and easy-drive system means it can be maneuvered with minimal effort during procedures. The steer and brake function is activated via a single lever. All C-arm movements are fully counterbalanced in every position, making the unit extremely comfortable to use. In addition, different colored scales and handles allow the surgeon and staff to quickly and easily select the desired function. The Vision Center is a rotating and tilting touchscreen control panel mounted on the mobile stand and the monitor cart. It provides access to the same, synchronized controls found on both units. This intelligent user interface coupled with clear and easy-to-follow icons makes operating the imaging system easy and intuitive. From a short list of anatomical programs, the operator simply selects the desired option to automatically adjust the imaging parameters to the region of interest, always ensuring the best image quality and lowest dose levels. Additionally, with SmartArchive it has never been easier or faster to access the current patient data at any time. The Vision Center is a touchscreen with an open, modular software architecture, ensuring maximum flexibility. This interface can be easily upgraded and expanded with additional software modules without the need for hardware changes.